Kasganj is a city and the district headquarters of Kasganj district in the Indian state of Uttar Pradesh. Kasganj was also known as 'Khasganj' during Mughal and British period. According to 'Imperial Gazetteer of India Vol. XV' (1908) by William Wilson Hunter Kasganj came in the hands of James V. Gardner (who was in the employ of the Marathas and later in the British service) and later died in here in Chhaoni, Kasganj. Before James Gardner, his father Colonel William Linnaeus Gardner was also stationed here. William Gardner built his estate in Kasganj after retiring from army and he also died in Kasganj in July, 1835. William and James Gardner belonged to the lineage of Baron Gardner of Uttoxeter, England. Evidences are that heir to the Barony of Gardner is still living somewhere around Kasganj. Famous writer and historian William Dalrymple also came to Kasganj in search of Julian Gardner, heir to the English Barony, while researching for his book White Mughals. Besides, the book of Fanny Parkes namely 'Wanderings of a Pilgrim in search of the Picturesque' gives details of her visits to Kasganj (then Khasgunge) and her mention of the town and Gardner Family. An older description mentioned Kasganj as standing on an elevated site, its drainage flowing towards the Kali Nadi(Black Stream) which runs about a mile south east of the town. The town was constituted a municipality in 1868. Kasganj set in the midst of the strategic Indo-Gangetic plain figured in military and political vicissitudes of ancient kingdom from the Mahabharata onwards. It formed part of the grand empire of Harshavardhan; and it finds mention in the accounts of the 7th century Chinese pilgrim Hsien Tsang (Xuanzang) who passed this way in 647 A.D.
Atranji Khera, a village near Kasganj, is a major Archaeological excavation site. This site was first identified by Sir Alexander Cunningham in 1862. Excavation here began in 1962, which revealed that site was occupied from 1200 B.C to 300 B.C. Various artefacts and ruined structures from ancient town have been found in Atranji Khera Achalpur (CHAUHAN’s kingdom). Another village near Kasganj, Jakhera is also a major archaeological excavation site. Iron tools like sickles, hoes, ploughshare and terracotta figurines have been found from Jakhera which dates back to 1000B.C. to 600B.C. giving evidence that Jakhera was a part of Painted Grey Ware culture and Northern Black Polished Ware culture of ancient India. Currently research is going on the collected artefacts. These evidences show that Kasganj has a rich history since ancient and medieval times. Kasganj was founded by Nawab Yaqoot Ali Khan, a descendent of the Nawabs of Farrukhabad. The city was known as Yaqoot Ganj in the early sixteenth century, but it later became popularly known as Kasganj because it was established in a thick forest of kans, a vegetation grown abundantly here. The inscription regarding its establishment is still visible in the city's Jama Masjid (big mosque). It is said that the well-protected building at Tehsil Road which houses the tehsil was the residence of Nawab Yaqoot Ali Khan until it was acquired by the British after fall of Awadh. The city was established here because it represented a centre point in the road connections between various small, ancient cities of District Etah, such as Bilram, Marehra, Etah, Sakeet, Atranji Khera and Aligarh. Kasganj is a city of rich cultural heritage. It is the junction of east, west and south UP, that very much reflects through peoples language,dresses and dishes. Direct impact of Brij Pradesh is very much evident. Hindu-Muslim culture is woven fine here. There is a long history of togetherness of both communities with love and respect to each other. Christians and Sikhs are also indispensable part of the society. Some important families of all the communities are the legend of a rich past. The articles,manuscripts of historical importance are available with some families of the city caring for heritage like Rao Mahinder Man Singh, family of Late Kunwar Bhartendra Singh Jain, Seth Uttam Chand Chandak, Nawabzada Haji Abdul Sattar Ali Khan(Mukhiya Family), Seth kishori lal ji,Pt. kishanlal dubey (head priest of royal family ) and some other families from Vaishyas, Brahmins, Thakurs of Piwari, Mehmoodpur, Kendi, Gorha & Kayasths as well. The city was established here because it represented a centre-point in the road connections between various small, ancient cities of District Etah, such as Bilram, Marehra, Etah, Sakeet, Atranji Khera and Aligarh. It was the junction of east, west and south UP, that very much reflects through people's language, dresses and dishes. Direct impact of Brij Pradesh is very much evident. Hindu-Muslim culture is woven fine here and there is a long history of togetherness of both communities with love and respect to each other. Christians and Sikhs also form an indispensable part of the society. 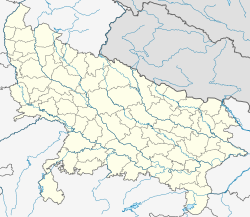 Kasganj is located at 27°49′N 78°39′E﻿ / ﻿27.82°N 78.65°E﻿ / 27.82; 78.65. It has an average elevation of 177 metres (580 feet). Situated on the banks of river Kali, the town is in proximity of the Himalayan foothills. It is located in the Doab, the area between the holy rivers Ganges and Yamuna and the alluvium soil makes the land one of the most fertile regions. A large number of surrounding villages depend on agriculture and related economic activities. Kasganj features a humid subtropical climate. Not far from the foothills of the Himalayas, the winters are moderate, with temperature sometimes reaching zero degrees. The summers are hot and dry, with temperatures regularly exceeding 40 °C. The monsoon season runs from the end of June to September. During the monsoon season, almost daily showers are not an uncommon phenomenon. From October onward, the weather is pleasant. Proper winter begins in early December. As per provisional data of 2011 census, Kasganj had a population of 101,241, out of which males were 53,507 and females were 47,734. The literacy rate was 77.36 per cent. †Includes Sikhs (0.21%), Buddhists (0.68%). kasganj district has 107 inter college (12th college), 8 I.T.I college, Government Polytechnic Soron Kasganj, 39 degree college, 7 post graduation college and 1 engineering college. Kasganj is strategically located and is well connected by road and railway network. It is situated on State Highway no 33 Agra -Budaun -Bareilly (also known as the Mathura-Barielly highway) and is 30 km away from the Grand Trunk Road, approachable from two places - Etah and Sikandra Rao. These towns are connected to Kasganj by road as well as Railways except Etah which is connected by road only. It is also connected to the capital of India, Delhi through very frequent roadways service. The frequency of road and rail transport to and from Kasganj makes it easily accessible day and night throughout the year. Soron, also known as 'Soronji' among its devotees mostly from Rajasthan is a small town known for its religious significance. It is located only 15 km from Kasganj. Since the construction of the road bridge on the 'Gangaji' it is very convenient to travel toward the Budaun and Bareilly side. Kachhla, a small settlement on the banks of holy river Ganges, locally known as the Ganga, is only 30 km from Kasganj. Kasganj has a well established rail network since the time of British rule. It lies on a trijunction and it is connected to Lucknow, Bareilly and Mathura through rail network in three different direction. Also trains to far away cities like Kolkata, Ahmedabad, Mumbai, New Jalpaiguri etc. are easily available. ^ Hunter, W. W. The Imperial Gazetteer Of India: Vol. Xv: Karachi To Kottayam. ISBN 9788170191117. ^ Dalrymple, William (8 December 2003). "Peer into the past". the Guardian. Retrieved 7 May 2016. ^ Parlby, Fanny Parkes; Ghose, Indira; Mills, Sara (1 January 2001). Wanderings of a Pilgrim in Search of the Picturesque. Manchester University Press. ISBN 9780719053504. ^ Gardner of Gardner's Horse, 2nd Lancers, Indian Army. Abhinav Publications. 1 January 1983. This page was last edited on 17 April 2019, at 21:07 (UTC).